Dog: Sketch Nothing impressive just a blitz session to see what I could do in 6-8 hours. Base mesh, base sculpt, retopologized, final sculpt, UV, Texture and then Houdini for Hair and Render. Good thing is I can continue to iterate on it now, but i think i would like to work on another mammal instead. Young Warrior Literally a sketch created over the weekend. Polypainted, fibermesh hair. Very free in terms of the creation process. I should develop this idea more. Marsyas The icon i have used on many a forum now. 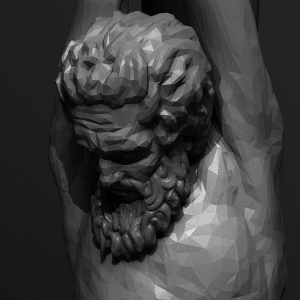 Based on a statue by an anonymous sculptor in the Louvre. The story goes, Marsyas challenged Apollo to a pan pipes duel (think Run DMC vs Jason Evans). He lost, and was flayed alive. No risk no reward. Asymmetrically modeled. Used as a low poly lighting test i liked the way it looked in the end decimated. Dante Was initially created for the Inferno themed project. I think this would be the next character i develop further. Perhaps into a Cybercop or Riot guard or even Tribal warrior. Crow Rider Modeled in Silo. Based on a design by Bjorn Hurri. Fun little character. I would have to redo the topology, it is pretty messy. But i like the concept and might develop further though i might make him a wolf instead of a crow to ride. Athena A simple anatomy study. Asymmetrically modeled. Perhaps one day i will come back and sculpt proper hair. I have a few ideas of what to do with the model. Edgar Allen Poe This little piece was based of a concept by Mark Newman. Sculpted in Zbrush from near enough a box.